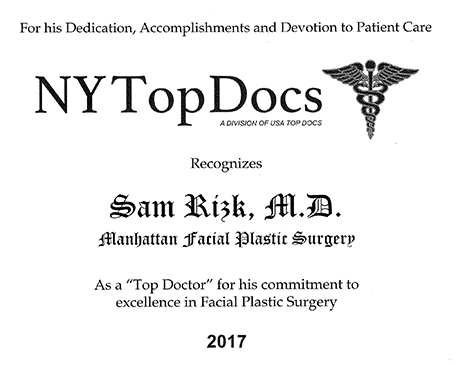 Introduction: Our doctor, a New York City double board certified facial plastic surgeon, sees an increasing number of male patients mainly interested in neck lifts. He has developed minimally invasive approaches for male patients to allow for recovery in a week. The liberal attitudes and changing standards of plastic surgery in our society have made it more acceptable for men to seek cosmetic surgery without shame. 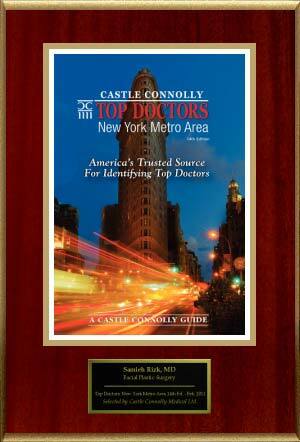 Our doctor customizes the procedure to the neck and does not do a stamped neck procedure for all patients. Sometimes the problem is only fat which can be improved only with liposuction, or it may be loose muscle or loose skin requiring either a platysmaplasty or cervicoplasty. 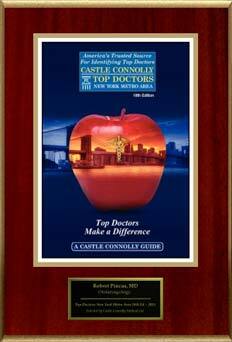 In all cases, Our doctor has shortened the scars because of the use of his high definition 3d telescope system. 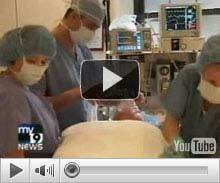 The procedures listed below are minimally invasive surgical procedures. 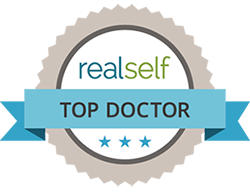 Our doctor does not condone thread lifts, string lifts, or other nonsurgical tightening devices with either radiofrequency or ultrasound. Our doctor does not believe any significant permanent benefit is achieved with the nonsurgical tightening devices using ultrasound or radiofrequency. 1. Men are less interested in a facelift than a necklift. If a facelift is performed on a male patient, it is mainly just a lower facelift and jowl lift, rather than a complete facelift. 2. Male necklift surgery can be done from the midline approach (small incision under chin) or the lateral approach (incisions behind ears and in hairline) or a combination of both approaches depending on how loose the neck is and if it has mainly loose muscle, excess fat, or loose skin. 3. Necklifts can be done on younger patients from a small incision under the chin only. This is done to treat the "turkey waddle" deformity. These patients have a combination of fatty deposits, which is genetic, and loose muscle but their skin is more pliable. In these younger patients, the incision is made and liposuction is performed from the small incision. Our doctor then uses his minimally invasive approach and inserts the small 3d telescope from the incision under the chin and the platysma muscle is tucked to achieve a nice neck contour. Liposuction is often inadequate on its own to achieve a superior result as the sagging muscle is an issue. This procedure is called platysmaplasty. 4. In older patients with loose skin, the procedure involves the incision under the chin and behind the ears to tuck the platysma muscle under the chin, but also to remove the excess skin behind the ear. This procedure is often called cervicoplasty where the excess skin is excised. 5. In either approach, either under the chin or behind the ears, Our doctor uses his minimally invasive techniques with shorter incisions made possible by the 3d high definition telescope technology. Visualizing the neck structures with the telescope enables a smaller incision and a more precise operation. Rapid Recovery: Patients are able to return to work in a week with minimal bruising. Our doctor does not use drains after the neck lift and instead uses tissue glues which decrease swelling and bruising. Patients usually return to work in 5-7 days depending on extent of procedure performed. Some patients who undergo more extensive neck work or a partial lower facelift at the same time may have more swelling. Pain: Male neck lift surgery has minimal discomfort and bruising involved. The neck will feel tight for a few weeks, but the pain factor is minimal. If you are bothered by the "turkey waddle", loose skin, or have a full neck and your weight is stable and are in good health, you are a good candidate. Generally, smokers have to stop for 2 weeks before surgery and 2 weeks after surgery. 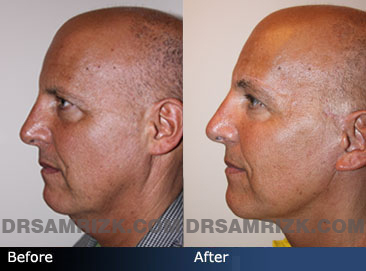 The procedure is designed to define the jawline and decrease the fatty deposition under the chin. It is important to have realistic expectations. How does aging occur in the male neck? Aging of the male neck is a combination of loose skin and muscle and in some cases fat. Some younger male patients have a genetic predisposition to deposit fat under their chin and these younger patients are good candidates for neck liposuction or a platysmaplasty necklift. Some male patients have poor jaw bone structure with a small chin and these patients start to deposit more fat under their chin as they get older and lose the angle between their jaw and neck. These patients are good candidates for a chin implant and a neck lift. 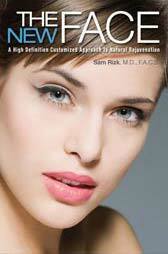 How is male necklift and facelift surgery different from female? The approach for male facelift and neck lift surgery is different because males are more interested in the lower face and neck rather than a full facelift. Also males are not interested in getting rid of every wrinkle but in just getting an improved jawline. The focus on male surgery is the jawline and the area under the chin. The approaches involves either a small incision under the chin, an incision behind the ear or both depending on the amount of fat, loose muscle and loose skin present. The incisions in men are also different to account for the beard and possibly lack of any hair to hide incision. Incisions are usually smaller in men which can be made possible with Our doctor's 3d high definition telescope approach. These telescopes are millimeters and are inserted through very small incisions to visualize neck structures and modify or lift them. Men tend to bleed a little more than women with neck lift surgery and this is why Our doctor uses tissue glues to decrease bleeding and bruising after facelift and necklift surgery (see published article on this topic by Our doctor in the "in the media" section of this website). Men are at slightly increased risk for formation of a hematoma (a pocket of clotted blood). 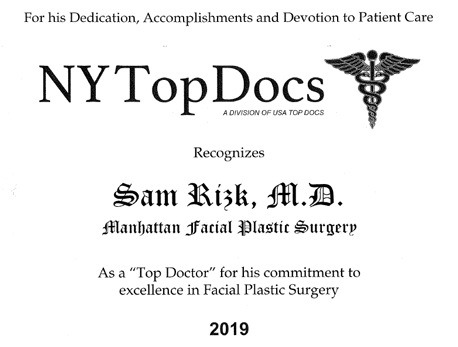 Our doctor has developed methods to decrease hematoma rates (see article on tissue glues in facelift surgery in "in the media" section of this website). Will I look feminine after a facelift or necklift? Our doctor does very natural surgery which should not change the way you look or your unique characteristics. The main advantage in neck lift or facelift surgery in men is to clean up the jawline and area under the chin. Adding a chin implant can emphasize the masculine structure of the face with a neck lift procedure. How do I avoid people knowing I had a facelift or a necklift? With Our doctor's customized approach to facelift/necklift surgery for men, there is not tell-tale signs of a facelift. Patients usually hide for a week but after a week, on average, people cannot tell you had a neck lift. 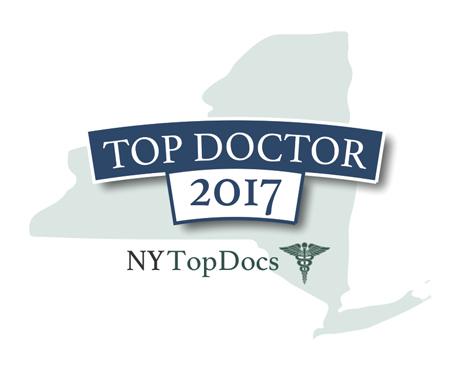 This is one reason Our doctor gets a lot of out-of-town male patients who fly in to do surgery and recover away from their social circle in New York City in a comfortable hotel environment. Nursing service at the hotel is provided and recommended by Our doctor in the first 24 hours after surgery. Are there other procedures that can be done at same time to improve the jawline with a necklift? Our doctor finds that he does chin implants in 30 percent of male patients undergoing a neck lift to help achieve a better jawline. The chin implant is placed from the same incision under the chin used to do the necklift and it gives a squarer and more youthful jawline. As we age our chin bone structure gets weaker and we start to deposit fat under the chin as our skin loosens. So if the bone structure is weak, it needs to be addressed to achieve an excellent outcome. How are incisions different in men than women for facelift and necklift surgery? Because men tend to wear hair shorter than women and because they have thicker skin, the scars for males have to be hidden under the chin and if needed around the back of the ear in a natural crease. Our doctor points out that the hairline incision behind the ear typically used for female surgery is much shorter in men. Additionally, because men have thicker skin, the small incision under the chin is a necessary approach to tuck the muscle in the middle and achieve a superior result (often called midline platysmaplasty). If men necks are just pulled sideways and tucked behind the ears, their result will me more short-lived than if the sideways tuck is combined with a central platysmaplasty (done from a small incision under the chin). What are benefits from a male necklift? How about laser liposuction with necklift? Sometimes if the problem is fat alone, a laser necklift or liposuction can be the procedure of choice where a laser probe that melts fat is inserted from a small incision under the chin. These patients can usually return to work the next day following the procedure. A good evaluation by a board certified facial plastic surgeon will determine whether the problem is fat alone or muscle looseness and/or loose skin. How do I choose a surgeon? Are there male necklift or facelift specialists? First, it is important to choose a surgeon who specializes in the face and neck areas alone, not a surgeon who does general body plastic surgery. A board certified facial plastic surgeon who focuses their practice on the face and neck and do not perform body plastic surgery is your safest bet. Then you need to find out if the surgeon does a lot of male neck lift and facelift procedure on a regular basis and perhaps seeing their photo gallery and speaking to male neck lift patients the surgeon has done. How long does a male neck lift last? Male neck lifts should last an average of 8 years if done correctly addressing all the components of aging, not just the skin. If weight fluctuates 20 pounds or more up or down then the longevity decreases. Can a neck lift be done as an office procedure? If you are medically fit for surgery, the procedure is typically done outpatient as an in office procedure and you go home the same day. 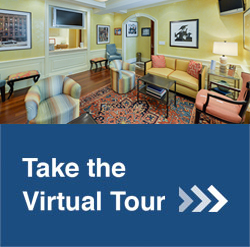 Sometimes out-of-town patients seeing Our doctor will stay in a hotel. 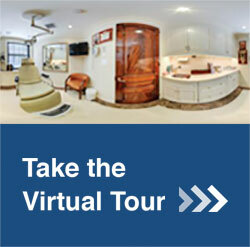 Our doctor's staff can arrange hotel stay for out-of-town patients. What kind of anesthesia is used for necklift surgery? Male Necklift surgery can be done under sedation anesthesia (twilight) or general anesthesia depending on patient and doctor preference. However, medical clearance is often needed and blood work needs to be performed prior to any anesthesia. Patients are given medications to decrease the incidence of nausea and the newer anesthetics also have anti-nausea properties. I am from out-of-town, how long do I have to stay in New York after my necklift? After Our doctor performs a neck lift, patients need to stay in New York City for 1 week at which point all sutures are removed. Our doctor's staff can arrange both hotel stay and nursing care. Typically, the patient will be sent to the hotel with a nurse for 12-24 hours. Nursing care is recommended for the first 12-24 hours and Our doctor has expert nurses that specialize in plastic surgery care. What is the rate of a touch up procedure after a male neck lift? Sometimes , despite everything done correctly ,the skin will loosen a little in first year, depending on the patient's skin elasticity and a small touch up procedure can be done to remove more skin under local anesthesia. This happens in about 5 percent of Our doctor's male patients. This rate is higher than in female patients because of thicker skin in men. Can a necklift be done alone as an isolated procedure or does it have to be done with a facelift? A neck lift can be done alone or in combination with a lower facelift, depending on the patient concerns and the degree of laxity of the jowl and lower face. 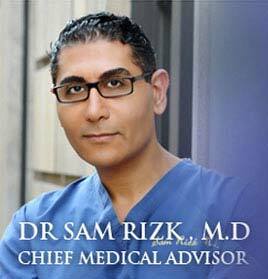 Our doctor has performed many isolated neck lifts in male patients successfully. About 25% of male neck lift patients in Our doctor's practice will also undergo a partial lower facelift with the necklift procedure. The recovery is still a week, even if the patient elects a facelift with the neck lift. What are risks of a facelift or necklift surgery in men? Like all surgery, male face lift or neck lift surgery do have some risks involve, although rare. Infection, bleeding, hematoma, scarring, and nerve injury are potential risks. Our doctor points out the most common complication nationally after facelift or neck lift surgery in men is hematoma formation which is a blood clot under the skin that needs to be suctioned out. The hematoma rate nationally is 10-15% in men and usually occurs in the first 24 hours. 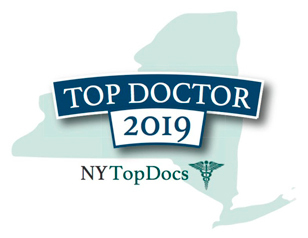 Our doctor's hematoma rate is less than 1 percent with the use of tissue glues and avoidance of postoperative surgical drains (see published article by Our doctor on hematoma rates with tissue glues in Archives of facial plastic surgery "in the media" section of this website). What is recovery like? When will I look presentable? You will have a bandage applied to your neck for the first 24 hours after the necklift or partial jowl lift procedure. After 24 hours, Our doctor will remove bandage and ice is then applied on the neck area for an additional 24 hours. After 2 days, you could walk around. There could be some slight bruising in the neck area. You cannot do strenuous activity or exercise for 2 weeks following the surgery but walking after 2 days is acceptable. You will then follow up with Our doctor in the office after 1 week for suture removal and will look presentable in a week following the surgery. Some patients may be more swollen than others. The out-of-town patients may fly back to their state or country in 7-10 days after the surgery. What followup care is needed? Our doctor will give you an elastic neck strap to use at night for the first 2 weeks after the neck lift and this strap helps to diminish swelling in the neck area for first 2 weeks. You should follow-up with Our doctor in 1 month, 3 months, 6 months, and a year following the surgery. Out of town patients should send pictures of their face and neck at 1 month, 3 months, 6 months and a year following the procedure. Our doctor will also give you certain herbal medicines which will expedite your recovery. Is there pain after the neck lift? There is minimal pain after the neck lift. The neck will feel tight and that feeling is normal for a few weeks. Usually patients take extra strength Tylenol for the discomfort but Our doctor will also prescribe prescription pain medicines for the first week following the surgery. What other things should I expect in recovery process? Temporary loss of sensation in skin around ears and neck is normal for a few months after the surgery. Sensation starts to return around the ear in about 3-6months after the surgery. You should sleep with your head elevated for several days after the surgery to help reduce swelling and decrease salt intake for 2 weeks before and 2 weeks after the surgery. Scars are usually imperceptible and hidden in crevices and grooves around the ear and under the chin. Scars remain pink for a few weeks and usually fade with time. Will my results look dramatic? Your neck will look significantly improved but not dramatic. Dramatic results in a male patient look unnatural and peculiar. Your neck and jawline will me more defined in a natural soft way and not too tight or overpulled. How do I prepare for my neck lift or facelift surgery? You will have a pre-surgery consultation with Our doctor where he will request a medical clearance from your medical doctor and give you pre/post operative instructions which are also on this website and you could print them out ahead of time. Avoidance of aspirin products including Motrin and also vitamin E, fish oil, and other herbal supplements is important for 2 weeks before and 2 weeks after surgery to decrease bleeding and bruising. Stay relaxed and healthy and decrease your salt intake. 55 year old patient interested in lower face and necklift who underwent necklift and a partial lower facelift to improve jawline.